Financial support provided by the Simons Foundation, MNiSW and IM PAN. Hyperkähler manifolds, K3 surfaces, Fano varieties, Calabi-Yau varieties, linear series. Tomasz Szemberg (Pedagogical University of Cracow). Joachim Jelisiejew (University of Warsaw). The activities start in Warsaw on Monday April 18, 2016 (Sunday April 17th will be the default arrival day), and conclude with a closing conference in Będlewo (near Poznań). 18-22 April 2016, Warsaw: Introductory school "Varieties of Calabi-Yau type (K3, Hyperkähler, Calabi-Yau)", Organisers: Lars Halvard Halle, Michał Kapustka, Oskar Kędzierski, Vladimir Lazić. 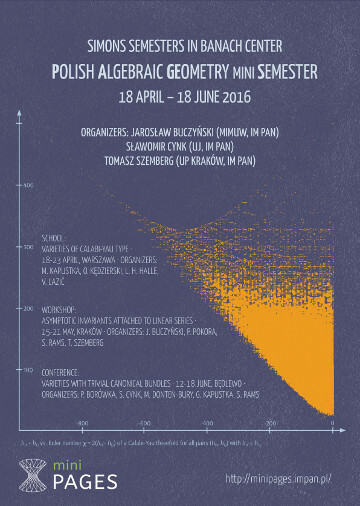 16-21 May 2016, Cracow: Workshop "Asymptotic invariants attached to linear series", Organisers: Jarosław Buczyński, Piotr Pokora, Sławomir Rams, Tomasz Szemberg. 12-18 June 2016, Będlewo: Conference "Varieties with trivial canonical bundles", Organisers: Paweł Borówka, Sławomir Cynk, Maria Donten-Bury, Grzegorz Kapustka, Sławomir Rams. In between, there were lectures, seminars and lecture series by the participants and short term guests (all in Warsaw). The schedule of activities during the nine weeks of minisemester is presented here. In publications an acknowledgement "This work was partially supported by the grant 346300 for IMPAN from the Simons Foundation and the matching 2015-2019 Polish MNiSW fund” would be appreciated. The proceedings of miniPAGES are published as a volume of Banach Center Publications, see details here.